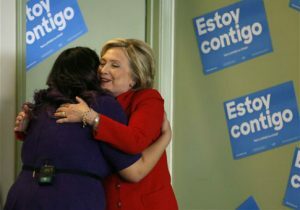 The Clinton campaign announced the "Mi Sueño, Tu Voto"—or "My Dream, Your Vote"—program on Sunday. The program uses stories about illegal immigrant children who are prohibited from voting to inspire Latino voters to register and vote against Donald Trump and Republicans, the Associated Press reported. Astrid Silva, the 28-year-old illegal immigrant who railed against Donald Trump during a prime-time speaking slot at the Democratic National Convention, was featured in the Clinton campaign’s press release announcing the new "Dreamer" effort. Silva said in the press release that while young illegal immigrants may not have the right to vote, the new effort will "help ensure that our stories are heard and it will send a clear signal to Donald Trump that we cannot be silenced." Silva is the organizing director of the Progressives Leadership Alliance of Nevada, a social and environmental justice group that is already involved in a massive campaign to register 400,000 Hispanic voters for the November election. That effort, known as the "Families Fight Back" campaign, is almost entirely funded by liberal billionaire George Soros. "The intense anti-immigrant and anti-Muslim rhetoric that has been fueled by the Republican primary is deeply offensive," Soros told the Hill in early March. "It is harmful to our democracy and our national interests. There should be consequences for the outrageous statements and proposals that we’ve regularly heard." The Families Fight Back campaign was announced in March by activist leaders from Nevada, Colorado, and Florida, and the immigration groups Center for Community Change, Latino Victory Project, and America’s Voice. "We are very aware that every day that our families are on the verge of being separated is a day that we have to fight for them," Silva said at its launch. "We need people to register, to vote, to become citizens. We want to make sure that the community understands their power, has access to the tools they need, and know that their responsibility to our country needs to be met." The Immigrant Voters Win PAC was then established to fund the Families Fight Back campaign. Soros and other liberal donors vowed to spend $15 million on the effort. Soros cut a $3 million check to the PAC on March 11. He was the only funder of the PAC until late May when the Civic Participation Action Fund, a group that seeks to advance "racial equality, economic opportunity, and civic engagement," added a $1 million donation. Silva did not return a request for comment by press time.